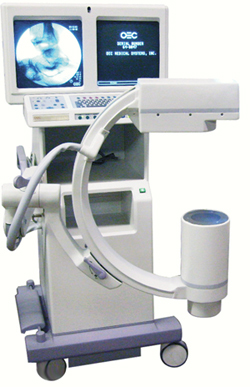 Fluoroscopy (Digital X-Rays) is an imaging technique commonly used by physicians to obtain real-time moving images of the internal structures of a patient through the use of a fluoroscope. In its simplest form, a fluoroscope consists of an X-ray source and fluorescent screen between which a patient is placed. However, modern fluoroscopes couple the screen to an X-ray image intensifier and CCD video camera allowing the images to be recorded and played on a monitor. This versatility allows the physician to see real time what an adjust during surgery will look like or where to best place a screw or pin. It also allows the physician to see the effect directional stresses have on an ankle to assess whether stability and ligaments are intact.